It is now 7:54 AM PT Time on Sunday, April 21, 2019. Currently there are 99 entrants. COURSE: The course is a rectangular course. One mile swimmers swim one lap two mile swimmers swim two laps. The lake temperature averages in the high 60’s in mid-September. EVENTS: One Mile Wetsuit, One Mile No-Wetsuit, Julie Montiel Fun Swim, Two Mile Wetsuit, Two Mile No-Wetsuit. ELIGIBILITY: Open to all 2018 registered Masters swimmers (USMS or FINA). The eligibility of a swimmer shall be determined by the age of the swimmer on Dec 31st of the year of competition, except for 18 year olds, who must be 18 on the day that they swim. USMS membership is available during the online registration process. Competitors not registered may sign up for a $22 USMS one day membership fee. REGISTRATION: Online registration only, paper entries allowed day of race only. USMS membership is available during the online registration process. Online registration opens on Sunday, July 15th and closes at 11:59 pm PDT on Thursday, September 13th or SOONER if race has sold out. REFUNDS: There will be NO refunds. If the race must be cancelled due to adverse conditions, dangerous waters, or other safety decision or act of God. Online entries are non-refundable and non-transferrable. RULES: Current USMS rules will govern this event. No wetsuits allowed, no additional devices to help speed, pace, buoyancy, or endurance are allowed (such as webbed gloves, fins, snorkels, etc). RULES: Current USMS rules will govern this event. The use of neoprene wet suits or other nonporous attire is allowed. No additional devices to help speed, pace, buoyancy, or endurance are allowed (such as webbed gloves, fins, snorkels, etc.). RULES FOR JULIE MONTIEL FUN SWIM: Fins, snorkels, masks and safety buoys allowed. Hand paddles NOT ALLOWED. This swim is not an official USMS time swim and your times will not be eligible for submission. AWARDS: Participation gift for all swimmers. 1st place award to top men and women finishers in each age group in each event (1 mile no wetsuit, 1 mile wetsuit, 2 mile no wetsuit and 2 mile wetsuit). Overall award to the fastest man and woman in each event. TIMING: Timing for this event will be provided by BUDU Racing. DIRECTIONS: From I-5: Take the South 188th St exit (#152); drive west 1 mile; turn left onto International Blvd (aka Pacific Highway South); drive south .5 miles; turn left on South 195th St into the park. Parking is limited at Angle Lake Park. Free parking is available at Angle Lake Light Rail Station at 19955 28th Ave South SeaTac. It is a 10 minute walk to Angle Lake Park. ADDITIONAL INFORMATION: Angle Lake is an L shaped community lake in the heart of Seatac, about 1 mile south of Seatac Airport. The park has a large beach and picnic area. Restrooms and changing areas are available. Picnic lunch will be free to all swimmers after the race. Family members and friends are welcome, donations accepted. BRING YOUR USA SWIMMERS! 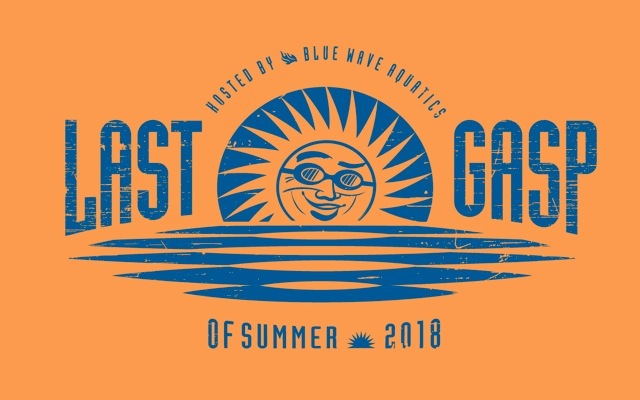 More information is available at www.lastgaspofsummer.com or contact Wendy Neely at wendy@bluewave-aquatics.com. Online Registration closed on 9/13/2018.